Casita Rural La Madriguera is renovated with one hundred percent of rural aroma, conserving its old details and adding endemic woods of chestnut and wild olive. Located in the urban area, in one of the quietest areas of the town, it consists of ground floor and first floor. 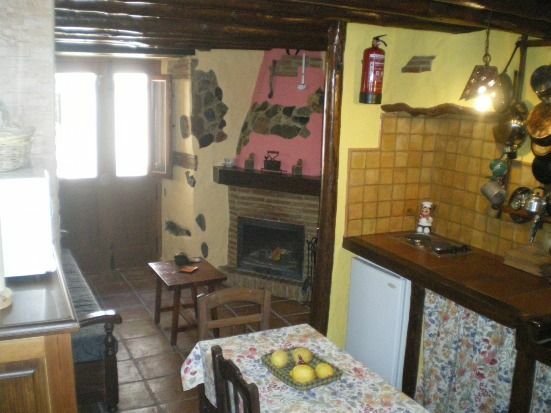 It has, living room with fireplace, fully equipped kitchen, two aceos with their clothes, and bedroom with double bed. The living room sofa has two extra beds. Beautiful place to visit, because we are in the heart of the Genal Valley, covered by chestnuts and cherry trees, a green and unspoiled landscape, where the main attraction is hiking, for its many routes. Through the routes we can match the native flora and fauna (roe deer, mountain goat, wild boar, foxes, eagles, buos, hoopoes, etc, ,,,,,,,,). We have the advantage that despite being in the mountains, about 600 meters above sea level, this is very close, about 30 km, in the town of Estepona. We are also 40 km from the town of Ronda, monumental city, and capital of the region. We always remember that Jubrique is the gateway to the Serrania de Ronda, on the western side. - On the ground floor is the living room, with sofa bed (two extra beds), fireplace, tv with dvd, kitchen equipped with: fridge, washing machine, hob, cooker, battery, cutlery, microwave, coffee maker, toaster, blender, iron, fan, radio. There is also a toilet. - On the top floor there is the bathroom, and a double bedroom with a balcony. Encontramos lo que buuscabamos una casita acogedora, tranquilidad y la ambilidad tanto de los propietarios como del resto de los Jubriqueños. Por cierto que rico que estaba el gazpacho calinete que hicieron el dia de Andalucía!! ¡Qué maravillosa casa, nos encantó! ¡Qué maravillosa casa, nos encantó! La casa estaba limpia, cómoda y se lo recomendamos a todos nuestros amigos.